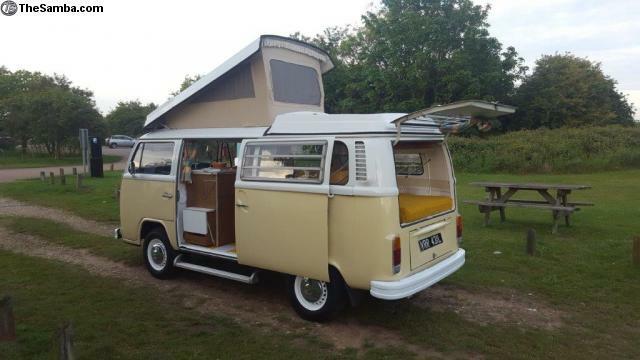 Reluctant sale of my beautiful 1973 VW Bay Window Wesfalia Continental Campervan. Westfalia number 3.00890. “Vanilla Ice” is in fantastic condition all round. The canvas roof has been replaced, as have the colour matched seat belts and door cards which match the rest of the van. 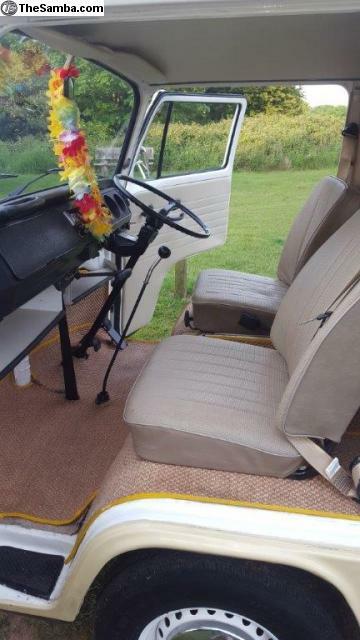 New flooring; mad matz Sisal in the cab and coloured tiles with VW logo in the back. Everything else on the van is standard and original, including standard ride height, standard wheels, original engine which a previous owner had reconditioned, and runs superbly. 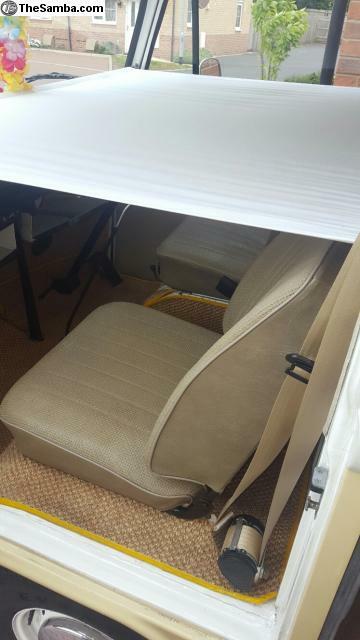 All the standard original Westfalia Continental interior is in fantastic condition with double rock n roll bed and original hammock over front seats, the original Westfalia stool and infill cushion, all of which is in the original fabric. Even the bunk bed in the roof is in perfect original condition. 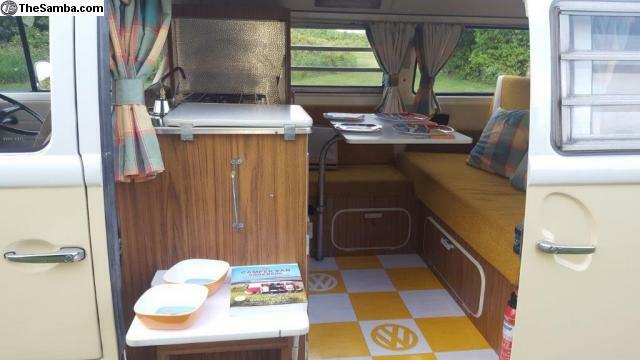 The original Westfalia Continental interior comes with 2 burner gas hob and sink unit with hand pump tap and an aftermarket electric pump fitted which runs off the leisure battery, plus wardrobe unit with mirror. The gas cylinder (almost full!) has new pipe and regulator. The additional fridge (not fitted) runs off the gas cylinder. I have loads of history with the van including many many receipts going back years and years and quite a number of old MOT certificates and tax disks. Vanilla Ice sleeps 5 and also has seat belts for 5 people. There is 240v electric hook up with socket and USB port and also leisure battery. 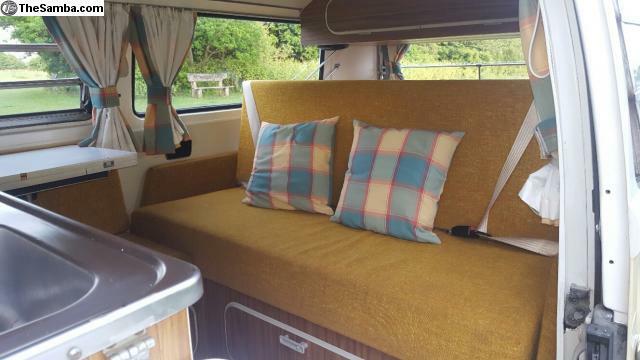 Also included is the curtains which fit all the way round and provide full privacy, and matching cushions. Historic vehicle; tax free. also MOT exempt, but has just passed MOT. Original right hand drive UK model. 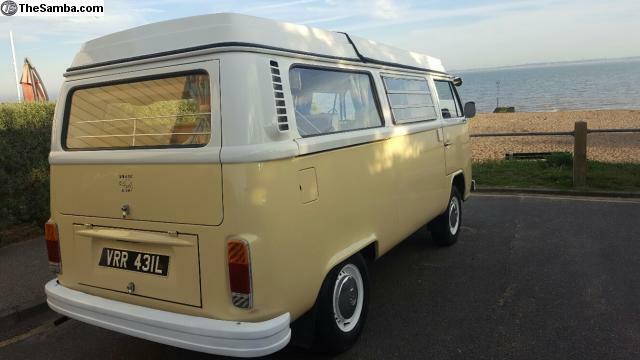 Also comes complete with original fly net for rear door, fly covers for louvre windows plus childs hammock over front seats; its complete with all the original Westfalia Continental interior pieces. 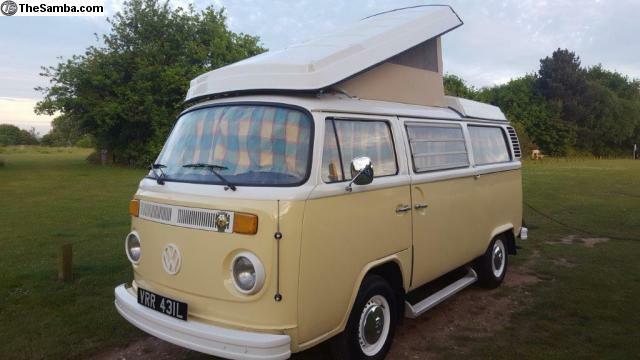 Lovely campervan in fantastic condition throughout. Pop top renewed 4 years ago. Original and complete: includes full set of curtain all round. Comes with original Westfalia interior, hob, wardrobe unit, cool box, sink with electric pump; 240v mains hook up with 3 pin socket and USB port, original Westfalia stool, infill cushion. VW logo flooring and new flooring in cab, looks amazing. Also included is the added bonus of an Electrolux 122 fridge and Wesfalia cupboard unit it fits in, so you can change the interior to suit your camping requirements. 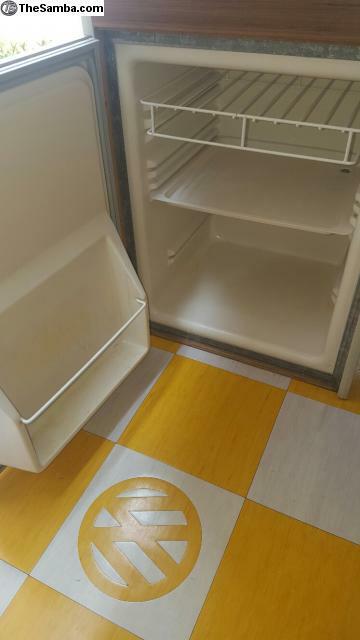 These fridge units are rare. 96,000 miles which I believe is genuine based on the history that comes with the van. This is a lovely van in fantastic condition and certainly looks fantastic. 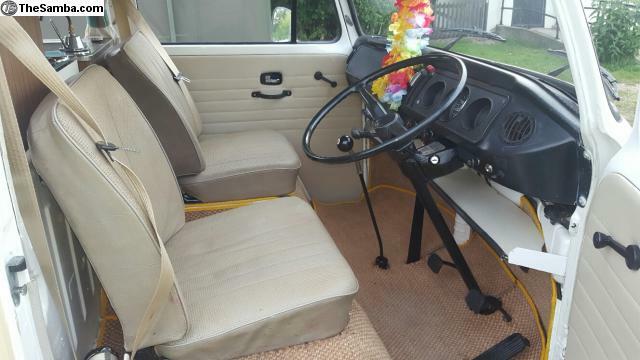 VW campervans in this good, original condition are getting scarce and are a good practical enjoyable investment. The only thing I can really fault it on is small dent (approx. 50p size) and paint chip in the rear where I reversed into my mountain bike, easily repaired. Vanilla Ice is a really nice head turning van, drives well and always gets lots of compliments and is ready to go to enjoy the summer.